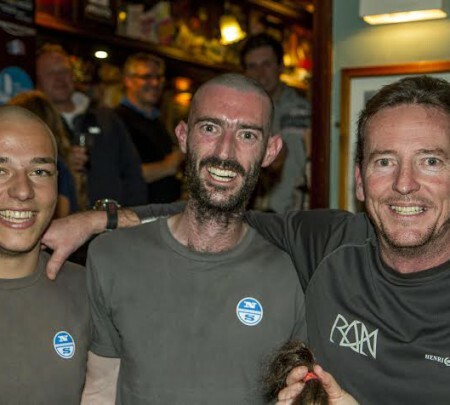 A dark and chilly Monday evening saw Gerry Faram from Sailcare.co.uk and his team of sailmakers, Robbie Southwell and Billy White undergo a full transformation in the hair department, all in aid of raising money for the Andrew Simpson Sailing Foundation. The event was hosted kindly by Sue Wescomb at the world famous Pier View, Cowes. Many local businesses had donated raffle prizes with top choices being a Go Pro camera, £150 to spend at the Henri Lloyd shop, Musto Luggage bag and a meal for 4 at the Pier View…and a late donation of a signed Australian Olympic sailing kit from Artemis Racing Americas Cup Team Head Coach, Andrew ‘Dog’ Palfrey. Andrew Simpson was a gold and silver Olympic medalist, an America’s Cup professional and an all round fantastic man who was tragically killed in a training accident on San Francisco Bay in May 2013. Cowes’ close knit sailing community were shocked by the tragic news of Andrew’s death back in May, with some in the town having sailed with him and many others finding inspiration from his incredible achievements and personable approach. Well done Gerry, Robbie and Billy, you may want to add a wig to your Christmas list now!